Soapstone Countertops – A Choice That Will Last a Lifetime - Carpentry Unlimited, Inc.
Soapstone is environmentally friendly. It is a naturally nonporous material and does not have to be finished or polished before installation. It is cut, shaped and installed. If you would like, you can choose to use a mineral oil to help bring out the natural color of the stone. This is not necessary, but some homeowners prefer the darker look. Soapstone is 100% recyclable. If you are interested in buying soapstone for your kitchen, check with your dealer about trying a sample first. Most reputable dealers will give you a sample to take home and try before you decide to buy it. It is your job to abuse that sample in every way you can think of. Drop things on it, set hot pots on it, try to stain it, burn it, scratch it, and chip it. Make sure it will stand up to whatever you are going to put it through. 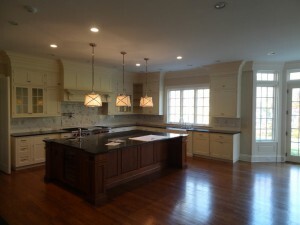 Soapstone countertops are incredibly durable. The ability to withstand heat, stains and scratches makes it a great choice that should last a lifetime in any kitchen.